Charles Rose was born in Gloucester, the son of a boot and shoe maker, and grew up at 2, High Orchard Street, St Luke’s, Gloucester. Later in life he became a wood sawyer. By 1901, then aged 28, Charlie was living at 3, The Knapp, Kingsholm with his wife, Ellen, and 3 children. Charlie was a forward, weighing in at 12st 6lbs, and standing 5ft 10½ ins tall. He became one of the most consistent forwards in the Gloucester team, renowned for his good scrummaging and for being very smart in open play. 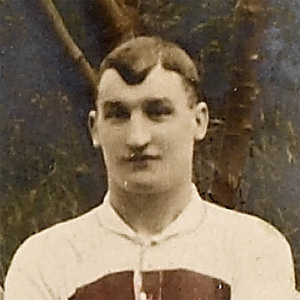 Charlie started to play rugby with the local White Star club, but then graduated to the Gordon Wanderers, where his performances brought him to the attention of the City club. He was thrown into the deep end with the Gloucester 1st XV, playing his first match away at Cardiff on 25th November 1893. Charlie had the distinction of scoring a try on his debut, but they were Gloucester’s only points in a 3-33 defeat. He played in ten matches that season, under the captaincy of John Hanman, without scoring again. Gloucester’s fixture list was shortened in March 1894, when the RFU suspended the Club and closed the Kingsholm ground for 3 weeks as a result of an enquiry which found the Club guilty of breaking the transfer and professionalism laws when selecting Walter Shewell of Stroud to play against Newport; John Hanman was suspended for the rest of the season for his part in the affair. The following season, Charlie was relegated to the Gloucester A team, and made only 2 appearances for the first team. But he was not disheartened, and by dint of sheer merit, he won back a permanent place in the 1st XV in the 1895-96 season, when he appeared in all but one of Gloucester’s 26 fixtures. Charlie scored a try early in the season in the 22-0 defeat of Weston-super-Mare, and another in the 3-5 loss to Penarth on 21st March 1896, which proved to be the last competitive match of the season when 5 fixtures were cancelled owing to an outbreak of smallpox in Gloucester. This was a poor season for the Club, there being 8 wins as against 12 losses under the captaincy of C Williams. In 1896-97, Charlie played in 28 of Gloucester’s 31 fixtures, and the team’s fortunes revived. Under a new captain, W H Taylor, the team managed 18 wins and 8 losses. In general, Gloucester had an excellent record against other English clubs, but struggled against the Welsh, although Charlie did play in the famous 5-3 victory against Llanelly on 3rd April 1897 at Kingsholm, when the Scarlets went down to their first defeat of the season. Charlie won his County cap this season against the Midland Counties. There was further improvement under W H Taylor in the 1897-98 season, with 24 wins and 5 losses, and Charlie played a full part in this revival, appearing in 32 of the 35 fixtures played. He also scored his fourth and probably final try at Clifton in a 13-3 win. Again it was the Welsh clubs which put up the fiercest opposition, although Gloucester achieved a memorable 9-5 victory away at Cardiff, of which the Gloucester Secretary, Fred Lovesy, wrote “the referee, Mr T Williams of Pontypridd was a wrong ‘un – Gloucester thoroughly deserved this victory, being the better team all round and with a fair referee would have won by more”. In addition to his prowess at rugby, Charlie was also a fine cricketer, and as a bowler accomplished some remarkable feats for Price Walkers, one of the leading clubs in Gloucester for many years. Indeed, in his obituary of Charlie, “WB” of the Citizen recorded that “Rose, I always understood, was approached more than once to take up cricket as a profession, but declined overtures to qualify for a county. He preferred to stick to his profession as a timber sawyer. Charles Rose retained the keenest interest in both his favourite games until illness laid him aside, and rarely missed a match at Kingsholm”.